Is ‘being too clean’ the reason why so many more people are allergic today? The idea that we are living in ‘super-clean homes’ that are ‘sterile bubbles’ where few microbes are to be found is simply a myth. Our homes, and our bodies, abound with all kinds of microbes. It’s also a myth that there is some clear scientific evidence that shows the more hygienic someone is, or the cleaner their home, the more likely they are to be allergic or have allergic children. But it is clear that the less hygienic you are the greater risk you run of infectious disease, which can have serious consequences, so we shouldn’t get complacent about hygiene. So having set that straight, why are so many more people allergic, and could the extent of our contact with microbes have anything to do with it? The rise in allergies has happened over several decades and is mainly in ‘atopic’ allergies, which are not caused or triggered by specific substances, and in some food allergies. Atopic allergies include hay fever, much childhood eczema and asthma. Scientists have been looking for reasons for the rise in atopic allergies for 20 years and more. It seems to be broadly connected with ‘western lifestyle’ but all that’s really clear is that many different factors are likely to be involved. The things still being investigated as possibly part of the explanation range from diet to diesel fumes, paracetamol to pollutants and genetics to lack of exercise. It’s clear that our contact with microbes – both harmful and harmless – has changed in many ways over the past century. This is partly through deliberate efforts to protect ourselves from infectious disease by using antibiotics and vaccines, as well as providing clean water and clean food and improved personal and domestic hygiene. But it has also happened through incidental lifestyle changes, such as the move from rural to urban living, and more indoor vs outdoor play. Assessing all the evidence, it seems very unlikely that everyone needs to get infected, with possibly fatal consequences, to get protected against allergies. But it’s distinctly possible that changed exposure to microbes of some kind is a factor. Growing up on a farm for example does seem to reduce the risks of having allergies as a child. But no-one’s clear yet exactly what it is about the farm that’s protective. If change in our contact with microbes is important, it’s likely that the microbes concerned are harmless, or harmless doses of harmful ones. So happily, the prospects are that we can turn the tide of rising allergy without turning the clock back and seeing infectious disease rise again. It’s unfortunate this idea was called the Hygiene Hypothesis, because it’s not really about ‘hygiene’ as we practice it today. Hygiene professionals, including the originator of the hypothesis, became very concerned that stories about the supposed dangers of ‘being too clean’ were confusing people and undermining our protection against infectious disease. You can read their assessment and advice here. And click here to read more from the experts on home hygiene, the IFH. 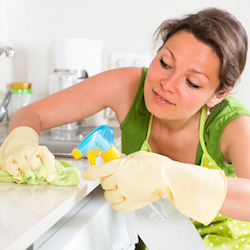 Don’t be paranoid about germs either – focus on the things that really matter and relax.